Several events of recent months have catapulted into public consciousness a topic that has long been an obsession of mine; the role of the media in shaping public opinion. The problem of false balance in 'objective' journalism, which dictates that the media is obliged to uncritically present opposing arguments in a contentious issue, was highlighted by the absurdity of US President Donald Trump's comments following violent white nationalist rallies in that country that led to the death of an anti-racist protestor. When Trump attempted to blame 'both sides' for this violence, he was roundly ridiculed for his false balance. Trump's is an extreme example of balance as bias, but he was simply attempting to use a well-worn journalistic tool to his advantage. Closer to home we have the postal survey on marriage equality. While The Guardian took the early initiative to state they 'won't be giving equal time to spurious arguments against marriage equality', other major media outlets, including Fairfax, have been publishing a litany of anti-marriage quality op-eds, presumably in the interests of 'both sides' journalism. Anything else, the argument goes, would be biased, or even worse, 'censorship'. But is the media obliged to air an opinion just because it exists? Ask many people, including journalists, what they think the role of the media is and they will likely respond along the lines of 'to let people make up their own mind'. But that is not strictly true. In a liberal democracy, the media's most essential function is to serve the public interest. Of course, this includes providing information so that the public can make informed decisions, the key word being 'informed'. In order to do so, journalists must decide what is in the public interest and why. In other words, they decide what is newsworthy and what the public 'needs to know'. It does this by ignoring or minimising some events and issues in favour of others. Some terror attacks get blanket coverage for weeks, others cause barely a ripple. Editors decide which opinion pieces to publish and which to pass on. "Journalism that serves the public interest promotes a harmonious, healthy society, not by merely airing all opinions that exist but by equipping citizens with the tools they need to participate in the democratic process." For the most part, we accept this as part of how the media works. Only when it comes to certain issues, is the accusation of 'censorship' raised. When I recently wrote that the media should not legitimise the claim that male privilege does not exist, I was roundly accused of censorship and silencing debate. But such accusations reveal a fundamental misunderstanding of the role and function of the media. It's not a matter of merely refusing to give time to certain views because I personally disagree with them, it's a matter of journalists weighing up each issue based on available facts in order to determine where the public interest lies. Male privilege is not a theory but a descriptive term for the advantages afforded to men, and is easy enough to prove in the sense that men dominate almost all facets of public life; politics, science, media, business, religion, and so on. Any media-led discussion of male privilege should be centred not on whether it exists but on what it actually means and how we can overcome it. This does not mean those who object should be silenced altogether, only that it is not within the bounds of the media's responsibility to the public to ignore facts and reality. To do so is to fail the function of helping people make informed decisions. Same goes for marriage equality. Before deciding how to cover that issue, media organisations should have asked themselves what the effects and implications of such a debate would be. The answer is already clear. The No campaign has been largely running, not on facts and evidence, nor on the singular issue of marriage itself, but on a fear-mongering platform invoking irrelevant issues of gender roles, Safe Schools, and the insistence that the religious beliefs of some citizens outweigh the legal rights of others. The public interest has not been served by this 'debate'. Rather, bigotry is being amplified and galvanised as the LGBTIQ community, the very group whose rights are being put up for public debate, are rebranded as bullies, and our public discourse has gotten more polarised, ugly, and less intelligent. If journalists continue to provide this kind of 'balance' while the government is cynically pitting citizens against each other, such treatment is likely to spread to other social issues. What other questions will citizens then be asked regarding the rights of others, and how ugly wil be the ensuing 'debate'? Journalism that serves the public interest promotes a harmonious, healthy society, not by merely airing all opinions that exist but by equipping citizens with the tools they need to participate in the democratic process. It is the responsibility of journalists and editors to hold opinions, as well as power, to account, by demanding a greater standard of truth, respectfulness and rigour from opinions that they air. Good to see La Civilta' Catholica in English being advertised here. Ruby Hamad starts off with “The problem of false balance in 'objective' journalism, which dictates that the media is obliged to uncritically present opposing arguments in a contentious issue” and segues to “But is the media obliged to air an opinion just because it exists?” even though the two extracts are not equivalent, the word ‘uncritically’ only appearing in the first. 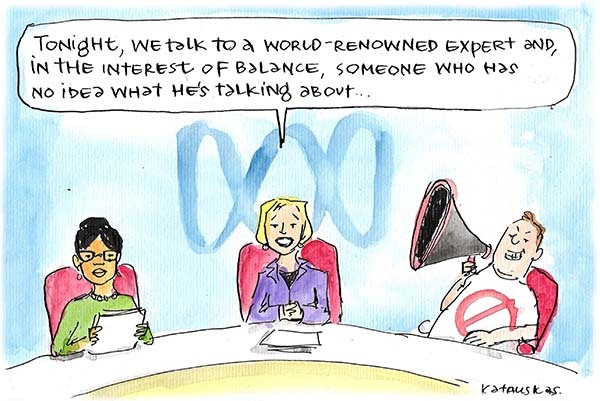 Yes, Ruby, the media is obliged to air an opinion just because it exists because news is what exists. No, Ruby, the media is not obliged uncritically to air the opinion. The journalist can take off his empirical investigator hat, put on his commentator hat, and eviscerate the opinion for whatever logical flaws it contains. When my son was a pre-schooler a song we sang together frequently was "Newspaper Mama". With three older children, I didn't have much time to actually read the newspaper. It was handy, though, for various things: putting under the children's painting easel to protect the floor, wrapping fragile glassware and as compost. It's very important for journalists to value their profession, otherwise the public won't. The insertion of the view that marriage equality is an unchallengeable right and to raise the question of consequential issues is bigotry hardly seems to be 'balanced journalism'? There is a tendency to believe that when/if 'both sides' are represented, then an issue's entire spectrum has been adequately attended to. I wonder if this is ever true - it seems to me that in practice emphasizing the poles simply polarizes any otherwise meaningful and helpful argument, with the place between the poles becoming (in the context of the discourse) evacuated, and reduced to irrelevance. Peter, Ruby Hamad's view that marriage equality is an unchallengeable right raises the question in Just War Theory, apposite in any treatment of divided public opinion, of proportionality. Human rights, as specified in this instance in the demand for an equal right to civil marriage, are inalienable and accordingly critically and primarily at stake here and therefore categorically not the question of access to sacramental or other religious marriage. Your position, seemingly conflating and equating the 'Yes' and 'No' votes on the lesser ethical grounds of procedural journalistic fairness, is the only bigotry that I detect in her otherwise 'balanced journalism'. "Journalism that serves the public interest promotes a harmonious, healthy society, ..." Yes, Ruby, but in Australia where media ownership with its attendant editorial bias is ever narrowing, as addressed by Andrew Dodd in this issue of Eureka Street, how can we, the public, expect to find a reasonable spread of significant information in the media, on any area of public concern? And no, the answer is not to be found in uncritical presentation of opposing arguments. The collapse of energy policy in the Federal Parliament is an example of the outcome one can expect in the absence of critical media commentary as a source for informing public opinion. Ruby, your ideal journalistic world would deny me the opportunity to hear someone's opinion because a journalist did not think it valid, "based on available facts". You are making a judgement about what is right and proper for me. This is not a right I wish to assign you or any other journalist. I want to hear an opposing view, no matter how vile you might consider that view to be. I believe it is my right to hear it. I also believe it is the responsibility of the media to air it. I pay for many subscriptions globally to support this belief. I would contend your views on media lie at the far left margin, not ever at serious risk of influencing the way media informs the public. More importantly, I believe most informed people have a diametrically opposed view to yours in which they will defend their right to hear all sides of an argument. It's difficult to foresee a enduring successful democracy in which the validity of a view is determined by the entitled few. Ruby, I will turn 70 at the end of this year. The standard of media reporting is at the worst state that I can recall in my 50 plus years of intelligent reading of newspapers, listening to the radio or watching TV. In my humble opinion the explosion of media diversity, the concentration of ownership of the major outlets, the sacking of journalists, the 24 hour new cycle and the emphasis on sensationalist news items as the news and the rise of 'false news' (not the Trump variety) as a biased source of information has destroyed any credibility the media may have had. The problem as I see it is not the attempt to be objective - but claiming to be objective. By reflecting the views of as many sides as possible (yes - multiple, not just two) is a better way of approaching the elusive goal of objectivity. No matter how bad we perceive the baddies to be - I'd like to know their evil intentions. There was a provocative article in The conversation a few years ago called 'No, you're not entitled to your opinion'. < https://theconversation.com/no-youre-not-entitled-to-your-opinion-9978 > The author, a lecturer in philosophy at Deakin Uni, argued that one is only entitled to what one can argue for. That's the position that The Guardian took in respect to the current 'debate' about marriage equality. Unfortunately Fairfax didn't and so un-reasoned opinions like those of the Member for Warringah were reported presumably because it was 'news' because it came from him. Although “journalists must decide what is in the public interest”, increasingly the public don’t believe journalists to be trustworthy. A 2016 Gallup poll found only 32% of Americans trust the mass media. A 2017 Quinnipiac poll showed that 70% of young people aged 18-34 actually think most members of the news media are dishonest. When Marshall Kirk and Hunter Madsen drew up their six-point plan to transform the beliefs of ordinary Americans with regard to homosexual behaviour, their method was “a planned psychological attack in the form of propaganda fed to the nation via the media”. Further, “our effect is achieved without reference to facts, logic, or proof.” Indeed, it’s the YES campaign with emotive slogans like “marriage equality” that is running “not on facts and evidence”. The chief appeal of the sexual politics of the Marxist Herbert Marcuse, was not intellectual but emotive, so that for those seduced by his spell, the underlying banality of his thinking disappeared. So if “our public discourse has gotten more polarised” we can thank gullible journalists seduced by the banality of sexual politics. As one Guardian journalist phrased it, Ginger Meggs, they refused to publish anything spurious as regards the marriage debate which accordingly only existed on the NO side as anything other than the religious argument - doomed to failure in relation to a civil claim yet it is the NO that argues rationally from the basis of anthropology, philosophy and science rather than emotively as Ross Howard illustrates. Let us not forget other little tricks like the size and type of photo placed alongside articles as well - that is not balanced and reading/thinking critically is an essential skill when opinions rule over the search for truth.